There's nothing like playing under the lights in a big game. At least, that's the theory. Some players love the big stage. Playing nationally televised games at night can leave you getting hyped up. You can at least imagine that feeling once, maybe even twice. You can imagine it getting a little bit old the third time. 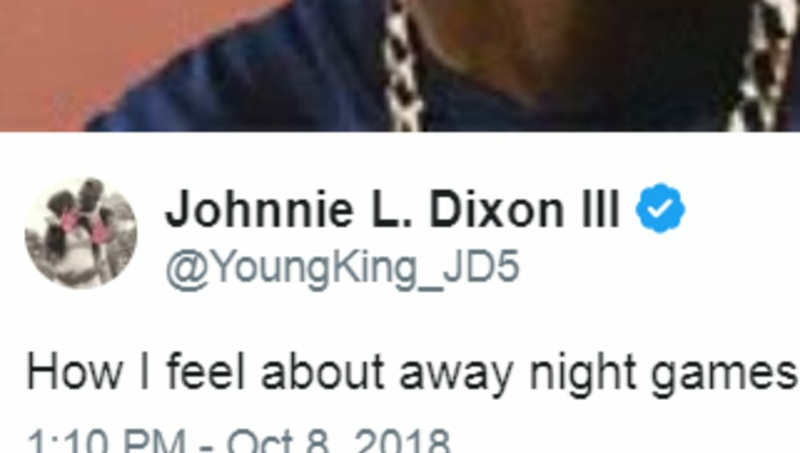 Ohio State wideout Johnnie Dixon III certainly doesn't love it anymore, as he voiced his displeasure on Twitter. It's not that he doesn't like the big stage. He just wants to be home in his own bed. Dixon is a leader and one of the captains on Ohio State, so you can make the leap that he's not the only one to feel like this. The Buckeyes have played on the road at night against TCU, Penn State, and now Purdue this weekend. No wonder why they're so tired. It hasn't slowed Dixon too much, as he's had three scores and over 200 yards from scrimmage so far this season. Hey, that's the price that comes with being one of the must-watch teams in the country.